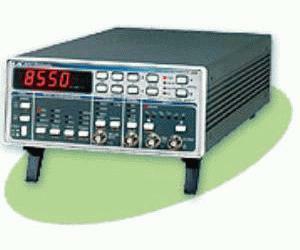 Model 8550 is a programmable function generator with extremely high performance. It provides a variety of signal waveforms to be used as test stimuli for a diversity of electronic devices. For improved immunity to RFI and EMI noise, the instrument is housed in an all-round metal case. The Model 8550 offers many features and functions, such as enhanced accuracy, eight different linear and logarithmic sweep modes, automatic phase lock loop, counted burst, and internal trigger generator. Besides its normal-continuous mode, Model 8550 offers a variety of interrupted and controlled modes. Output waveforms may be gated, triggered, or may generate a burst of pre-selected number of cycles. The generator also provides a number of externally controlled modes, including VCO, FM, AM, and PLL.